MP3 Tag Clinic is an application which allows you to modify the ID3 tags of your MP3, FLAC, APE, OGG, WMA tracks, and others. The user interface of the program is plain and simple, thanks to the treeview. So, once you have located your music files, you can edit their file name, title, artist, album, comments, year, genre and track number. In addition, you can open a file in the default media player, create a playlist, send to desktop, cut, copy, paste, delete it or change its attributes (e.g. read only, archive). Furthermore, you can switch to the “Rename” tag to edit the track format (e.g. album, track, artist, title), select a “build template”, separator, bracket style and caps. Also, you can replace text. 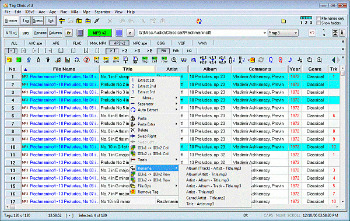 Moreover, you can use a search function, composer and conductor editor, automatically rename tracks, as well as enable various automatic editing options, such as “auto-cap”, “anti-cap”, “trim leading space”, “trim trailing space” and “trim over-length”. The tool uses a low-to-moderate amount of system resources and contains a complete help file with snapshots. We didn’t have any problems testing it. The interface could have welcomed some improvements when it comes to navigating within its many features. Since it comes bundled with a lot of configurable options, we mainly recommend MP3 Tag Clinic to experienced individuals, although novices can get a simple task done as well.